Cup of Coffee 5/1: It was a night of notable pitching in the Red Sox system as a pair of top ten prospects started on the mound in Greenville's Anderson Espinoza and Salem's Travis Lakins. Roenis Elias started for Pawtucket while Justin Haley turned in the most dominant performance of the day for Portland. Many of the big bats in the organization struggled on Saturday night but Sam Travis had a good game for the PawSox while Kyri Washington and Chad De La Guerra swung the bat well for Greenville. The PawSox were simply unable to string enough hits together in a shutout loss to Syracuse on Saturday afternoon. Roenis Elias started on the mound for Pawtucket, lasting 6 2/3 innings but receiving the loss after allowing four runs on five hits and three walks. Elias was followed by Roman Mendez, who allowed a run in 1/3 of an inning, and Jorge Marban, who allowed three baserunners but no runs in an inning of work. The PawSox bats were able to reach base eleven times via seven hits and four walks but they just couldn't push any runs across the plate. First baseman Sam Travis was the offensive standout for Pawtucket as he went 2 for 4 with a double, pushing his line to .289/.326/.434 on the young season. Blake Swihart, who made his second start in left field, went 1 for 4. 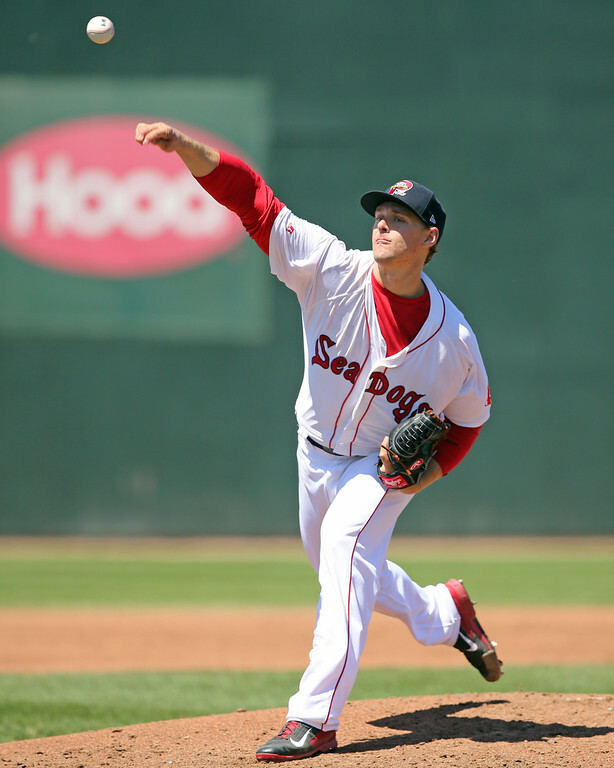 Despite a strong performance by the Portland lineup on Saturday, the pitching was the real story for the Sea Dogs. Justin Haley took the hill to start the game and was phenomenal across five innings, allowing only a run and punching out nine batters. In the sixth inning, Carson Smith entered for the second consecutive game on his rehab assignment, looking excellent and striking out a batter in a perfect inning. Williams Jerez then allowed a pair of runs before turning the ball over to Chandler Shepherd, who struck out three in two scoreless frames. It was a powerful day for the Sea Dogs' bats, who registered three solo home runs in a six-run performance. Portland scored their first run in the third inning by virtue of an RBI triple by Henry Ramos, who was 2 for 4. Jose Vinicio hit a solo home run in the fifth inning as part of a 2-for-3 game which saw him score a pair of runs. Bryce Brentz and Jake Romanski hit back-to-back home runs in the sixth inning. A two-run single by Tzu-Wei Lin in the seventh inning netted two more runs for Portland. The big bats in the Salem lineup didn't stand out on Saturday night but the rest of the lineup was able to come through and lead the Red Sox to the win. The Red Sox picked up an early run in the first inning on an RBI single by Danny Mars. The rest of Salem's runs came in a three-run sixth inning. Salem picked up runs on an RBI single by Rafael Devers, an RBI double by Ben Moore, and an RBI single by Deiner Lopez. Nick Longhi had a solid night at the plate, going 2 for 4 with a double and bumping his average up to .292 this season. Travis Lakins, who was drafted in the sixth round last season, threw six strong innings for Salem on Saturday. Lakins allowed only a run on two hits and two walks while striking out four batters, lowering his ERA to an impressive 2.13 mark. Ben Taylor followed Lakins in relief and allowed a couple of runs in two innings. Jake Drehoff worked the ninth and earned the save with a perfect inning and a strikeout. Anderson Espinoza was the starting pitcher for Greenville on Saturday afternoon but he struggled in a loss for the Drive. Espinoza allowed six runs, five of which came in a seven-run fourth inning for the BlueClaws, in 3 2/3 innings on four hits and three walks. Espinoza now has a 4.50 ERA in 22 innings pitched in Greenville. Victor Diaz entered the game after Espinoza and allowed four runs in 2 1/3 innings. Jeffry Hernandez finished off the game with two shutout innings. Though the Drive's pitching staff struggled on Saturday, the lineup showed up in full force. The Drive scored three runs in the third inning, with a two-run single by Chad De La Guerra and a sacrifice fly by Tate Matheny capping the rally. The Drive scored the rest of their runs during a four-run outburst in the sixth inning. Josh Ockimey led off the inning with a double then promptly scored on a two-run home run by Kyri Washington. Then, with two outs in the inning, the Drive loaded the bases and pushed two more runs across on another single by De La Guerra, who was 3 for 4 with 3 RBIs and a walk in the game. Player of the Day: Justin Haley is off to a strong start for Portland and he turned in his best start of the young season on Saturday night. Haley allowed just one run on four hits and a walk in five innings while striking out nine batters. The 24-year-old Haley is off to a strong start for Portland, where he has a 3.09 ERA with 26 strikeouts and 6 walks in 23 1/3 innings.